The Freedom Trail is a walking trail through Boston, Massachusetts. It passes by 16 places that are important to American history. The Trail is 2.5 miles (4.0 km) long. It starts at the Boston Common and ends at the USS Constitution in the Charlestown Navy Yard. The Black Heritage Trail crosses the Freedom Trail between the Massachusetts State House and Park Street Church. William Schofield, a journalist in Boston, first thought of creating the Freedom Trail. In 1951, he suggested building a walking trail to connect many of the important historic places in Boston. Boston's mayor, John Hynes, agreed. The Trail was marked with red bricks and red paint, and signs were added along the way to explain the importance of the Trail's 16 stops. By 1953, 40,000 people were walking the Freedom Trail every year. The City of Boston's Freedom Trail Commission is in charge of the Trail. The costs of keeping up the Trail are supported by grants from non-profit organizations and foundations; philanthropy; donations; and Boston National Historical Park. The Common was also used to punish and hang people. In 1775, when the British Army occupied Boston just before the American Revolution started, over 1,000 British soldiers camped and trained on the Common. Anti-war and civil rights rallies, including one led by Martin Luther King, Jr. The State House is where the Massachusetts state government does business. It was built in 1798 on land that used to be John Hancock's cow pasture. It is topped by a big dome which Paul Revere coated with golden copper. On the way from the Common to the State House, the Trail passes a monument to Robert Gould Shaw and the 54th Massachusetts Infantry Regiment. This was the first all-black volunteer regiment in the American Civil War. Built in 1809, Park Street Church was once the tallest building in Boston. The Church became an important supporter of the abolitionist (anti-slavery) movement. On Independence Day in 1829, William Lloyd Garrison made his first major speech against slavery at the Church. During the War of 1812, the Church's members stored brimstone (which is used to make gunpowder) in the Church's basement. Many other Bostonians are also buried here. King's Chapel was the first Anglican church in Boston. It was built in 1688, on land that was part of a burying ground (cemetery). At that time, most people in Boston were Puritans. King James II, who wanted the colonists to follow the Church of England, ordered that an Anglican parish should be built in Boston. However, nobody in Boston would sell good land to build a non-Puritan church. Because of this, the King ruled that a piece of burying ground would be taken and used for the church. The original Boston Latin School was torn down in 1745, but a statue of Benjamin Franklin marks the spot where the original school was. Boston Latin School still exists today in a different place (and now teaches both boys and girls). The Old Corner Bookstore is the oldest business building in Boston. It was built in 1718 as an apothecary shop. Before it became a business, Anne Hutchinson lived in this building. She used to hold religious meetings in her home, where she would read scripture. Sometimes as many as 80 people would come to the meetings. This was more than 10% of Boston's population at the time. Eventually Hutchinson was accused of heresy for preaching without being a preacher. (At that time, no women were allowed to be preachers, and Hutchinson's ideas also disagreed with the Puritans'.) Hutchinson was excommunicated and exiled to Rhode Island in 1638. Some of the events that led up to the American Revolutionary War happened at Old South Church. For example, five thousand people met at Old South Meeting House just before the Boston Tea Party in 1773. They were trying to decide what to do with the tea that was waiting on ships in Boston Harbor. After the British passed the Tea Act, Bostonians would have to pay taxes on the tea even though they had no say in whether the taxes were fair or not. They tried to have the tea sent back to England, but they were unable to. After this, Samuel Adams got up and said, "This meeting can do nothing more to save the country." This was a secret signal to tell the Sons of Liberty to go destroy the tea. This is how the Boston Tea Party started. Several years later, when British soldiers were occupying Boston, they got revenge on Old South Church for its role in the Boston Tea Party. They ripped out the church's pews (benches) and turned the church into a horse stable. They used Old South Church to teach British cavalry soldiers how to ride horses. After the Revolutionary War was over, in 1783, the church's members fixed the building up into a church again. The Irish Potato Famine memorial statue is on the way to the Old South Meeting House. During the Irish Potato Famine, over one million Irish people died. Another million Irish people immigrated to the United States, mostly to Boston. The statue shows a family that was dying of starvation, who became strong and healthy again after moving to Boston. The Old State House. The stone monument on the ground marks the site of the Boston Massacre. The Old State House was built in 1713. The Massachusetts Bay Colony's colonial government worked there. The Old State House was very important in starting the American Revolution. In 1768, the colony's House of Representatives decided that people in Massachusetts should refuse to pay taxes to the British. The British decided to get rid of the colony's legislature, and also sent soldiers to occupy Boston. In 1776, the Declaration of Independence was read to the people of Boston for the first time from the balcony of the Old State House. The Boston Massacre happened just in front of the Old State House, in 1770. After British soldiers occupied Boston, many people in Boston got angrier and angrier. On March 5, 1770, an angry mob of Bostonians surrounded British soldiers. Somebody yelled "fire," and the British soldiers started shooting their guns. Five Bostonians were killed. After news about the Boston Massacre spread throughout the Thirteen Colonies, people became angrier at the British. The Boston Massacre made more people want to fight the British for independence. A rich merchant named Peter Faneuil built Faneuil Hall in 1741. He meant Faneuil Hall to be a place for trade and business. However, it became an important meeting place for people who wanted to fight against British rule. The Sons of Liberty met there and announced that they would fight back against the British. Leaders like Samuel Adams gave speeches there encouraging independence. America's first town meeting was held at Faneuil Hall. Americans first met there in 1764 to protest the Sugar Act and the Stamp Act. Later, they would meet there to protest the Tea Act, the Townshend Duties, and the British occupation of Boston. On top of Faneuil Hall, there is a famous weathervane (which tells which way the wind is blowing). It is shaped like a golden grasshopper. Legend says that Bostonians used this weathervane during the War of 1812 to find spies. If a person did not know the answer to the question "What is on top of Faneuil Hall? ", they were suspected of being a spy. In the 19th century, abolitionists like Frederick Douglass, William Lloyd Garrison, and Lucy Stone spoke against slavery at Faneuil Hall. The Paul Revere house is the oldest building in downtown Boston that is still standing. It was built around 1680. Revere bought it in 1770. He lived here when he made his famous "Midnight Ride". The Old North Church is the oldest church in Boston that is still standing. This Episcopal church opened in 1723. The first bells ever brought to America were put in its steeple. Because the steeple was the tallest in Boston at the time, it played an important role just before the American Revolution started. Just before the Battles of Lexington and Concord, the first battles of the Revolution, the British had two choices for how they could get to Lexington and Concord. They could walk, or they could row across the Charles River. The Sons of Liberty hung two lanterns in the church's steeple to signal that British soldiers were crossing the Charles River. This helped the Americans figure out the best way to defend against the British. Robert Newman, the man who hung the lanterns in the Old North Church on the night of Paul Revere's "Midnight Ride"
British soldiers put their cannons at Copp's Hill Burying Ground during the Battle of Bunker Hill. The Bunker Hill Monument honors the Battle of Bunker Hill. This was the first major battle of the American Revolution. Though the British won this battle, it was so difficult for them to win that the battle proved the Americans would not be easy to beat. Until May 2015, the USS Constitution was the oldest warship in the world that still floated. It was first put into the water in 1797. The Constitution became famous during the War of 1812. The ship got the nickname "Old Ironsides" because cannonballs would bounce off the wooden sides of the ship like they were made of iron. The Constitution is still a United States Navy warship. ↑ "Freedom Trail". City of Boston. Retrieved November 1, 2013. ↑ 3.0 3.1 3.2 3.3 "Boston Common". TheFreedomTrail.org. The Freedom Trail Foundation. 2015. Retrieved February 15, 2016. ↑ 4.0 4.1 "Boston Common". CityofBoston.gov. City of Boston. Retrieved February 15, 2016. ↑ "Massachusetts State House". TheFreedomTrail.org. The Freedom Trail Foundation. 2015. Retrieved February 15, 2016. ↑ Cox, Clinton (1991). Undying Glory: The Story of the Massachusetts 54th Regiment. New York: Scholastic. ISBN 978-0590441711. ↑ 7.0 7.1 7.2 "Park Street Church". CityofBoston.gov. City of Boston. Retrieved February 15, 2016. ↑ "Granary Burying Ground". CityofBoston.gov. City of Boston. Retrieved February 15, 2016. ↑ 9.0 9.1 9.2 9.3 "King's Chapel and Burying Ground". CityofBoston.gov. City of Boston. Retrieved February 15, 2016. ↑ "Boston Latin School". Britannica.com. Encyclopaedia Britannica. January 5, 2015. Retrieved February 15, 2016. ↑ "Benjamin Franklin Statue and Boston Latin School". TheFreedomTrail.org. The Freedom Trail Foundation. 2015. Retrieved February 15, 2016. ↑ "Old Corner Bookstore". TheFreedomTrail.org. The Freedom Trail Foundation. 2015. Retrieved February 15, 2016. ↑ Hall, David D. (1990). The Antinomian Controversy, 1636–1638, A Documentary History. Durham, North Carolina and London: Duke University Press. p. 5. ISBN 978-0-8223-1091-4. ↑ Morris, Richard B (1981). "Jezebel Before the Judges". In Bremer, Francis J. Anne Hutchinson: Troubler of the Puritan Zion. Huntington, New York: Robert E. Krieger Publishing Company. pp. 58–64. ↑ Miller, Edwin Haviland (1991). Salem Is My Dwelling Place: A Life of Nathaniel Hawthorne. Iowa City: University of Iowa Press. p. 281. ISBN 0-87745-332-2. ↑ 16.0 16.1 16.2 16.3 "Old South Meeting House". National Historical Park: Massachusetts. United States National Park Service. 2016. Retrieved February 15, 2016. ↑ 17.0 17.1 Carp, Benjamin L. (2010). 'Defiance of the Patriots: The Boston Tea Party and the Making of America. Yale University Publishers. ISBN 978-0-300-11705-9. ↑ Labaree, Benjamin Woods (1979). The Boston Tea Party. Boston: Northeastern University Press. pp. 66–67. ISBN 0-930350-05-7. ↑ "Old State House". TheFreedomTrail.org. The Freedom Trail Foundation. 2015. Retrieved February 15, 2016. ↑ Hitchings, Sinclair (1975). Theatre of Liberty: Boston’s Old State House. Boston: Boston Safe Deposit and Trust Company. ASIN B0006WKXMW. ↑ 22.0 22.1 22.2 Allison, Robert (2006). The Boston Massacre. Beverly, MA: Applewood Books. ISBN 978-1-933212-10-4. OCLC 66392877. ↑ 23.0 23.1 23.2 "Faneuil Hall". TheFreedomTrail.org. The Freedom Trail Foundation. 2015. Retrieved February 15, 2016. ↑ 24.0 24.1 "Faneuil Hall". National Historic Park: Massachusetts. United States National Park Service. Retrieved February 15, 2016. ↑ 25.0 25.1 "Paul Revere House". CityofBoston.gov. City of Boston. Retrieved February 15, 2016. 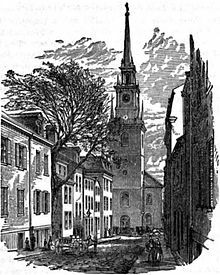 ↑ 26.0 26.1 "Old North Church". CityofBoston.gov. City of Boston. Retrieved February 15, 2016. ↑ "Old North Church". National Historical Park: Massachusetts. United States National Park Service. Retrieved February 15, 2016. ↑ "MACRIS inventory record for Copp's Hill Burying Ground". Massachusetts Cultural Resource Information Center. Commonwealth of Massachusetts. Retrieved February 15, 2016. ↑ Brooks, Victor (1999). The Boston Campaign. Conshohocken, PA: Combined Publishing. p. 127. ISBN 1-58097-007-9. OCLC 42581510. ↑ Ketchum, Richard (1999). Decisive Day: The Battle of Bunker Hill. New York: Owl Books. pp. 208–209. ISBN 0-385-41897-3. OCLC 24147566. ↑ Brown, Eric (21 October 2009). "Hundreds Join Old Ironsides' Return to Sea for 212th Birthday". Navy News Service. Archived from the original on 28 August 2012. ↑ 32.0 32.1 "The Only Ship Left in the US Navy That Has Sunk an Enemy Ship is 217 Years Old". foxnews.com. Retrieved 20 October 2015. ↑ Toll, Ian W (2006). Six Frigates: The Epic History of the Founding of the US Navy. New York: W. W. Norton. p. 350. ISBN 978-0-393-05847-5. OCLC 70291925. ↑ Edward Mitchell Bannister. "Boston Street Scene (Boston Common)". The Walters Art Museum. 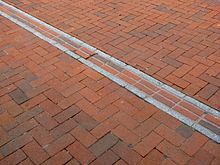 Wikimedia Commons has media related to Freedom Trail. This page was last changed on 13 October 2018, at 06:28.